Hard won community mitigation is taking shape in Waterview. The Albert- Eden Local Board opened Waterview Reserve in December 2015. The Board worked with the community in 2010 and 2011 to ensure that appropriate mitigation was secured for the communities negatively affected by the SH16 and SH20 Waterview Connection project. As a result there is an exceptional new playground, volleyball court, netball post and basketball court. There is a skatepark and BMX track to be built in 2016/17. “The new park is just one of the conditions contained in the 189 page book of conditions. 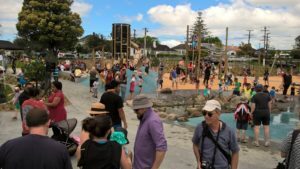 The Local Board thought this could be improved on, and funded waterplay features, BBQ’s, volleyball nets, fale-inspired shade and a waka sculpture to reflect the community it serves” says Albert-Eden board member Margi Watson. 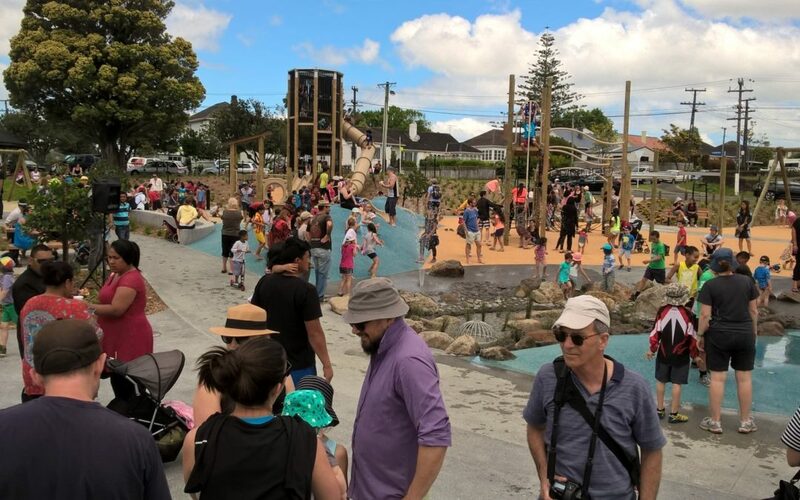 “People say it’s the best new park in Auckland and it is fantastic that the City Vision team has been a big contributor to the final result”.